Nate Platzner/Contributing Photographer Corazón de Dahlia and the Omega Phi Beta Sorority Incorporated host a discussion about domestic violence and sexual assault in Latin America. One in three Latinas have experienced domestic violence in their lifetime and 50 percent of Latinas who experience violence never report it, according to statistics read at the Domestic Violence and Sexual Assault in Latin America event on Thursday evening in the University Union. 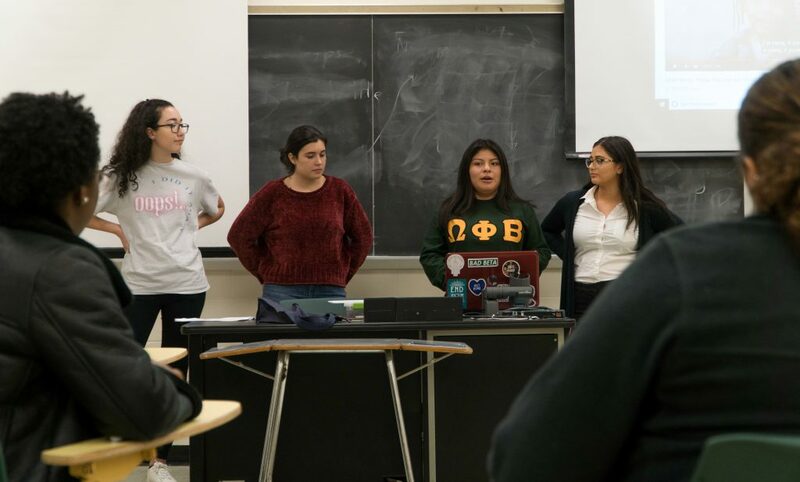 Hosted by Corazón de Dahlia, a fundraising organization that supports social and academic enrichment for children in Peru, and Omega Phi Beta Sorority Incorporated, the event aimed to educate students about the prevalence of domestic and sexual violence in Latin America. The event started by defining domestic violence and reading statistics related to domestic violence. Attendees were then shown a clip that featured Miss Peru candidates giving out gender violence statistics in order to draw attention to how women are mistreated, an act that strayed from the traditional beauty pageant climate. According to the organizers, these laws are not strictly enforced, and although Latin American countries have laws against sexual violence, aggressors often face few consequences for their abuses. Ana Maria Suarez, secretary of Corazón de Dahlia and a senior majoring in integrative neuroscience, said the event aimed to increase awareness about domestic violence. “We wanted to collaborate on this event to bring awareness of the severity of domestic violence in our area and also Latin American communities,” Suarez said. Additionally, organizers spoke about sexual violence in the United States, discussing different ways people can take action, such as writing letters to petition for the reinstatement of the Violence Against Women Act, a bill issued in 1994 to provide more enforcement for prosecuting those who committed sexual assaults, or supporting local institutions that aid victims, such as the Crime Victims Assistance Center, an organization that provides counseling and assistance for domestic violence and assault survivors. Afterward, the room split into two groups, with one group discussing four poems by sexual abuse survivors and the other making bracelets for crime victims at the Crime Victims Assistance Center. After reading the four poems, the group discussed which poems they found powerful. They were then asked to write their own poems about a difficult time in their lives, not necessarily having to be related to domestic violence. Some voluntarily shared their poems. Savannah Markel, a junior majoring in human development and an organizer from Omega Phi Beta, said her sorority’s philanthropy focuses on all forms of violence against women, including violence committed by family members, intimate partners or friends. Markel, who also works as a legal intern at the Crime Victims Assistance Center, said her job is to advocate for people so that they will not be taken advantage of by the legal system and to make sure their rights are being met. She added that most crimes victims she meets with are women of color in the Binghamton area. “The purpose of this event for us is to basically just raise awareness, give back to the Binghamton community by helping with [the Crime Victims Assistance Center] and also just [show] healthy coping skills when people are affected by it and when their loved ones are affected by it,” Markel said. Delia Martinez, a senior majoring in electrical engineering and one of the attendees at the event, said it is important to break the stigma about the sexual violence discussion.